The intersection of two lines, each given by a pair of points (i.e. the respective equations are not used), is obtained by elementary vector considerations. 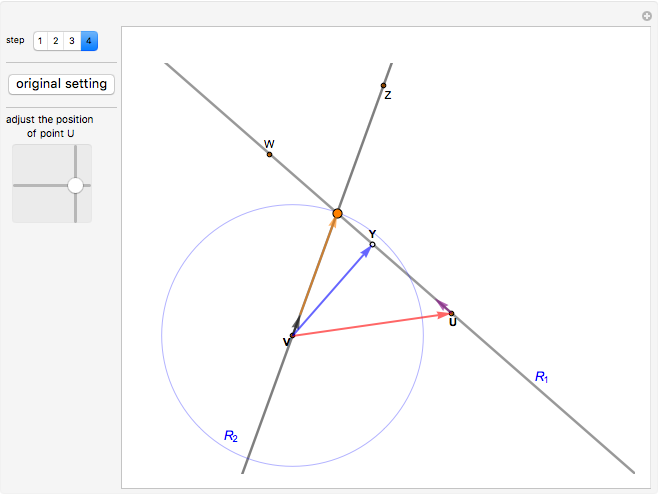 Objective: to find the intersection of the two lines and . The projection (blue line ) of the red segment through perpendicular to onto has magnitude , where is the angle between the red segment and . In vector terms, the tip of the blue vector is at a distance from , so that its position vector is , where is a unit vector (in purple). Use the positive sign whenever ; otherwise use the negative sign. Let be the angle betwen the lines and . 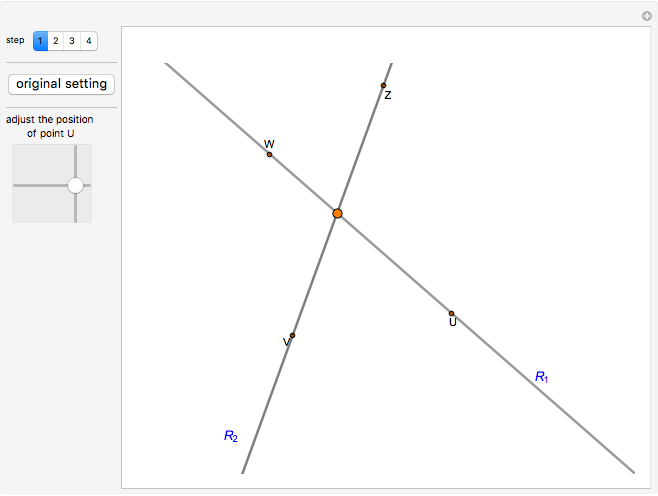 The point of intersection of the two lines (in orange) lies at the distance from (with ), so that its position vector is , where is a unit vector (in black). Choose the sign to give the position closest to . ( , implying that the two lines are not parallel), where and are the position vectors of the points and , is the length of the red segment, and is a unit vector in the direction of the line , from to . Tomas Garza "Intersection of Two Lines Using Vectors"